Amid heated competition for leadership of the main opposition party, voter turnout has come in at 24.58 percent, lower than the 25.24 percent recorded in 2017, the Liberty Korea Party said Monday. 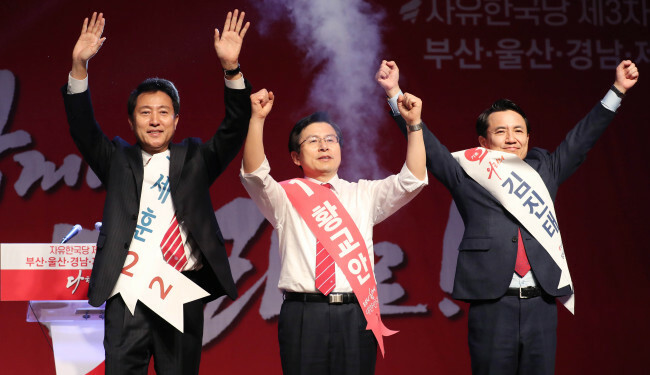 Former Prime Minister Hwang Kyo-ahn has emerged as a leading candidate, increasingly appealing to ultraright members of the party and taking the lead in opinion polls. However, this year’s turnout has not reached the level seen in 2017, when previous party leader Hong Joon-pyo was elected. During two days of mobile and on-site voting, 90,943 of the party’s 369,952 members are eligible to cast votes, the party’s election commission said. The new party leader will be finalized Wednesday, after adding up mobile and on-site votes that are to account for 70 percent of the final score. Results of a public opinion poll will account for 30 percent of the final score. The two-day poll targets the general public through Tuesday evening, the party said. In the lead-up to the national convention, Hwang had come into the spotlight during a debate last week. He had replied in the affirmative to rival candidate far-right Rep. Kim Jin-tae’s question on whether he believed there was a possibility the tablet PC that belonged to former President Park Geun-hye’s confidante Choi Soon-sil and played a vital role in revealing the influence-peddling scandal had been fabricated. Hwang had initially drawn criticism for his vague stance on the legitimacy of Park’s impeachment. Rep. Kim Jin-tae -- who is at the center of controversy due to his radical views -- has been insisting the tablet PC was fabricated and Park’s impeachment was unjust. Hwang came in first place in an opinion poll of 710 supporters of the Liberty Korea Party last week, garnering 60.1 percent of votes, according to local pollster Realmeter. Kim and Oh followed with 17.3 percent and 15.4 percent, respectively. “Supporters of the Liberty Korea Party chose the most well-known candidate. Rep. Kim is not a national-level candidate, coming across as an extreme figure even among party supporters,” said Shin Yul, a political science professor at Myongji University. Shin anticipated that the 8,000 delegates who will cast their votes Wednesday are highly likely to vote for Hwang. Oh added that a leader should resolve the distrust in the court’s impeachment ruling among main opposition supporters, pointing out that Hwang is catering to core supporters.